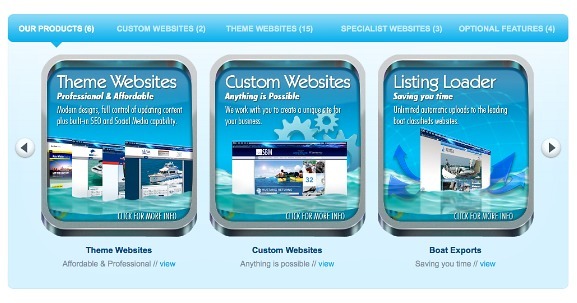 Get more buyers and website traffic from search engines with a professional new boat website. Yacht and Boat developed the Boat Deck website platform exclusively for the marine industry. Our custom and template boat websites are specifically designed for the marine market. We have built over 350 boating websites for boat dealers and brokers, boat brand manufacturers, boat charter companies, yacht clubs, marinas and fishing businesses. Our goal is to deliver affordable, easy to manage websites that have automatic Social Media and Search Engine Optimisation capability built-in. Showcase your listings with stylish image galleries, videos, pdf brochures – even audio tours! Find out why our customers love our marine websites, view our current boat website templates or contact us today to discuss your custom website requirements. We look forward to building you a powerful new website! Your background in the Marine Industry was invaluable in creating our personalised site. The team at Yacht and Boat came highly recommended…Their approach was professional and extremely well cached for the novice of the www world, and the result is a refreshing new image, a site that is easy to navigate and easy to manage. Don’t waste time searching the web…stop here…you won’t be disappointed. The hits to our site have substantially increased and so have the many compliments we continually receive. The feedback we receive is that our site is attractive, informational and professional.